The Firebear CoinPayments Magento 2 module works just the same as any other payment extension. It means that you get smooth integration with Magento 2 cart and checkout, admin-friendly backend interface, intuitive configuration, and of course customer-oriented frontend experience. If you are looking for a Magento 2 Bitcoin extension, a Magento 2 Ethereum module, or a universal Magento 2 cryptocurrency payment gateway, you’ve come to the right place. Below, we describe core features of our product. As you might have already guessed, the Firebear CoinPayments Magento 2 module is based on the CoinPayments platform which now accepts more that 60 altcoins including such popular cryptocurrencies as Bitcoin and Ethereum. You can see the whole list of supported coins here: CoinPayments Currencies. Such a wide support means that our integrated payment gateway will also provide the same opportunities. 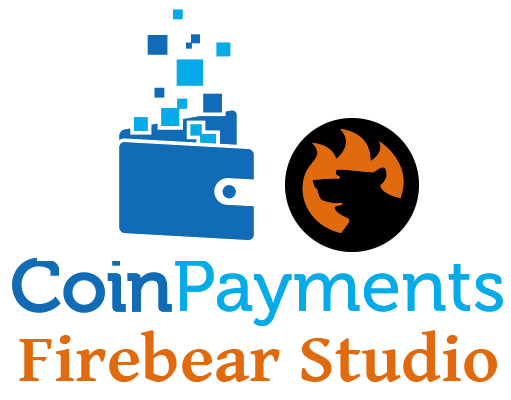 At the same time, you can still use the Firebear CoinPayments extension, if you need just a Magento 2 Bitcoin plugin or an Ethereum payment gateway. Support for over 60 altcoins doesn’t mean that you should use all of them. 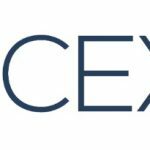 Our extension allows to accept only the selected cryptocurrencies during the checkout. What are other features, provided by the CoinPayments platform? First of all, it is integrated with BitGo. There are two core consequences caused by this integration. 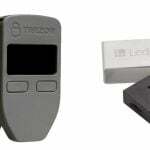 Superb fast Bitcoin payments with BitGo and superb secure hot wallet with the multisig technology support. Therefore, Firebear CoinPayments is the ideal Magento 2 Bitcoin extension: install it and you will enhance your ecommerce website with the most modern payment opportunities. 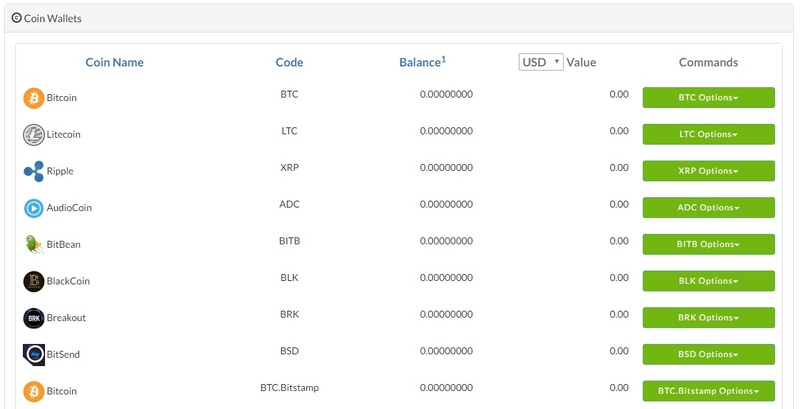 Here, you can view Top Coin Balance. For instance, we have the only coin in the wallet – Ether. The grid shows its balance as well as appropriate value in Bitcoin and fiat currency (you can select one). 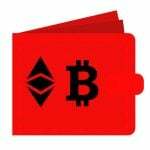 Under the list of your coins, there is a row that displays an estimated value of the entire wallet in BTC and selected fiat currency. 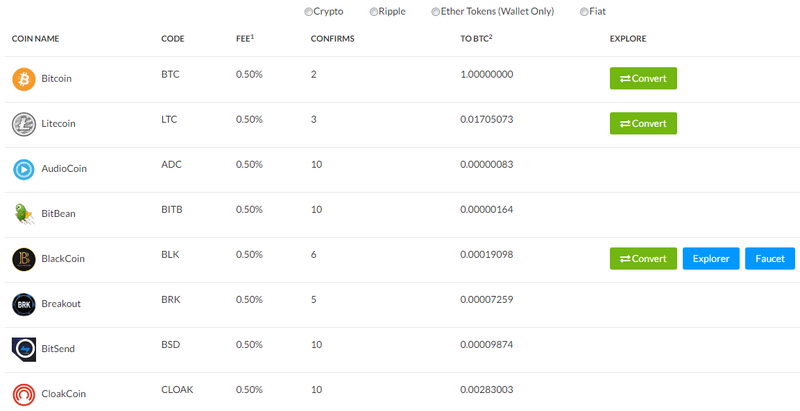 Below, there is a grid with recent transactions that shows the time of transaction, its direction (to or from), the name of recipient or sender, coin, amount, and status. Everything is clear and intuitive. Next, let’s take a look at Coin Settings. 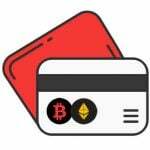 It is a configuration page for your cryptocurrency payment gateway. Here, you can select coins you’d like to accept, specify payment address, select payout mode, specify discount (can be 0%), and set a limit on a transaction value. These payments go directly to your PayPal account. Furthermore, neither CoinPayments nor our Magento 2 cryptocurrency module do not collect any fees on them. In Bulk Conversion Settings, you can set up automatic conversion of coins to the selected cryptocurrency. Note that there are two payout methods available: To Balance – when coins are stored in your CoinPayments Wallet; or ASAP – when coins are sent to the specified address. To convert all coint to Ethereum and store it in a local wallet, select “To Balance” for Payment Mode, leave the address field empty, and select “ETH” for Convert Coins To. 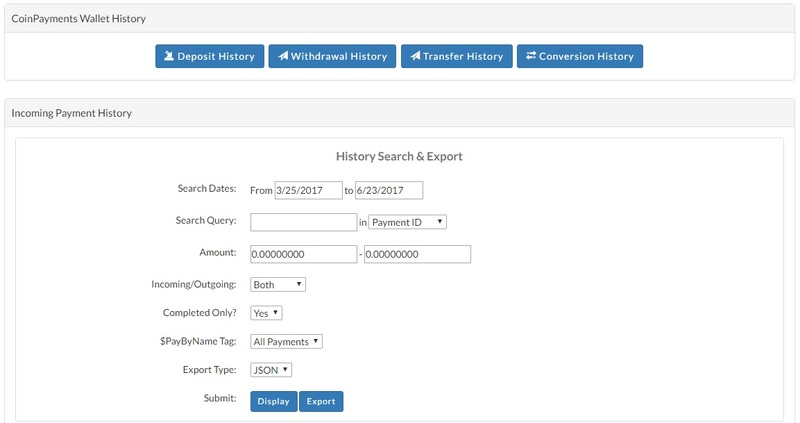 In Transaction History, you can view separate logs for deposits, withdrawals, transfers, and conversions. There is also a section with filters called History Search & Export. Here, you can configure such parameters as search dates, query, amount, incoming or outgoing, completed or not, and $PayByName tag. Formats available for export are: XML, CSV, and JSON. And since our Firebear CoinPayments Magento 2 module supports full integration with the platform, you will get the same features in Magento 2. It’s the best time to start accepting cryptocurrency since the popularity of this phenomenon is constantly rising and there are more and more people willing to use Bitcoins to shop online.